I can honestly and finally say that I am comfortable in my own skin. Sure there are things that I wish I could change. They are mostly things that changed as I became the home to my tiny for 10 months. like a battle wound or scar that I am boastful over. Before tiny I would have worried about it. I would have wondered what people thought. But now I wear my body with pride. 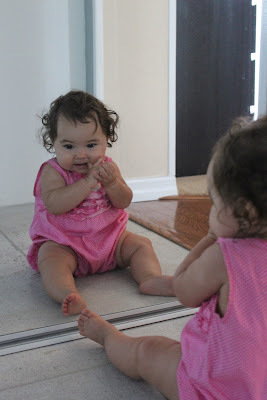 So when I see tiny so enamored by her own self it makes my heart giddy. To see her cheer for her own self is the best feeling in the world. but if she doesn't already, one day soon she will. And I can only pray she will be just as happy then as she is now. As she examines herself in delight, I pray that this will never change. Being a Woman can be difficult. that we aren't good enough just the way we are. But my tiny doesn't fall for that. She knows she's brilliant just the way she is...chubby thighs and all. And I pray that she always sees herself this way. That she knows God created her to be exactly who she is and nobody else. I pray that she knows that she has her biggest supporter right behind her.